The Future of Light is Now! The Mac Tech 6 Convertible is truly a versatile lighting tool. It will outperform and take the place of old style top lights, coops, and pars. 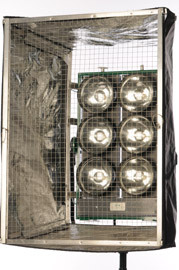 It can hang at any angle for lighting green & blue screens or be used while filming special effects with rigging. Yes it is time to Go Green for you next shoot. There are no bulb options for the Mac Tech 6. Instead, the light comes with HPL bulbs and a complete set of lenses.